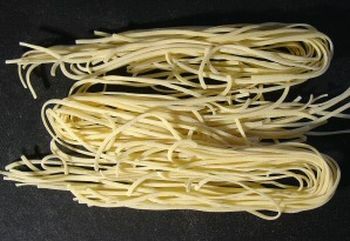 Trenette is a type of narrow, flat, dried pasta especially associated with Genoa and Liguria. Trenette is the most traditional form of pasta served with pesto alla genovese, a dish known as trenette al pesto, which can also include potatoes and green beans boiled in the same water. Recipe using Trenette see Here, Here, Here and Here.